We are your local IT Consulting / Computer Consulting experts who can assist in all aspects of software implementation, as well as repairing your network and server, whether they run on Windows or Linux. Like most small business, you may not have the luxury of having your own Information Technology department to take on new projects or tackle complex challenges. You may be just barely hanging on to what you currently have and praying that your systems do not break down. We are here to come in with our knowledge, expertise, and experience to do the job of the Information Technology Department you wish you had. Premise Wiring can be something that is either trouble free, or an endless source of headache. It all depends on how well your premise wiring is planned, installed, organized, and finished. Investing in quality wire, connectors, and mounting will insure against future problems and make maintenance much easier. If you are building a new office, you want to get us involved in your wiring project as soon as possible, preferably in the initial design phase well before the walls go up. Most electricians will do exactly what you tell them to do with no concern for design or how well the network system will turn out. We are designers, implementors, and maintainers who hope to keep you as a satisfied customer on a maintenance plan for a long time supporting your mission critical operations. We have access to the best available, commercial grade, wire, supplies, panels, and finish to do the job right. Your customers will notice right away whether or not your wiring was installed professionally. If the wiring in your office is a product of evolution and looks like a disorganized mess that nobody understands, we can help taim your jumble of wires and bring back a reasonable level of reliability. Premise Wiring can include: Computer Network, Alarm System, Surveylance System, Telephone, Audio, and Video, Satalite, and Cable. We do it all. 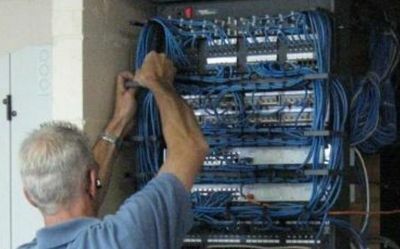 Not only do we do the wiring, but we also work with your service providers to make sure that their services are brought in and connected to your network. Is your computer system technology stuck in time? Computer Technology changes over time and eventually you will need to modernize, or bring your systems up to current specifications. Is that old server and software that has served you well for many years starting to show signs of its age? Is your system no longer capable of running the now current version of the software you need to run your business? We can help with a carefully planned and implemented IT Modernization project. There is much more to migrating to new servers, workstations, and software than simply replacing machines. Data has to be transferred, preserved, and updated. End users need to be trained on new software and procedures, and in the end, everyone needs to see the change as an improvement. For over 30 years, CMI has been installing, upgrading, and maintaining business computer systems all over Indianapolis and central Indiana. We enjoy working with small and medium sized businesses and medical practices, helping them grow, and run smoothly. We help you take the advantage with the best of available technology. Our customers include Medical and Dental Practices, Retail Stores, and just about everything else from Accounting to Manufacturing. Installing successful systems and establishing long relationships with our customers, by maintaining those systems, is what we do best. CMI can serve as your your Outsourced IT Department. As a result of downsizing, cost reduction, or employee turnover, you may no longer have anyone around to take care of your computer systems. Our services cost a lot less than employing a full time IT person. We pride ourselves in saving our customers much more money than our services cost. We help you make the right decisions on how to invest your IT Budget wisely in order to keep your computing environment running smoothly. We help you keep up with the ever changing technology, IT modernization and computing demands, while at the same time recommending practical, cost effective solutions. Give us a call. Tell us what you are trying to accomplish. We are not afraid to take on new technology. All technology starts out as new technology. Every project and solution is unique. We are not afraid to try something that nobody has done before in order to give your business a competitive edge. We are constantly absorbing new technology as technology itself evolves with time. There are several companies around Indianapolis where we installed their first personal computers. We installed the first PC Network in Indianapolis. We were pioneers when the Internet first started by setting up one of the first Internet Service Providers in the area. Doctor and Dentist offices are constantly having us integrate new medical equipment with their practice management software and servers. Just because something has not been done before, does not mean that it can't be done and we can't do it. We are also available to help you evaluate new technology to see if it is necessary and will actually improve your business. We can help in the decision and evaluational process to help decide which new technology to take on. This is not our first trip to the rodeo. Over the past 30 years, we have implemented and gained working knowledge with supporting business software packages of all types around central Indiana. We know what it takes to get the job done and done right. We will make sure you have all the tools and guidance you need to get that software package fully implemented. We then continue to support your system well into the future. The old saying of "Garbage In - Garbage Out" has never been more true. We will show you how we implement software and systems the right way. Give us a call so we may meet and discuss your server needs. We have experience setting up both Windows and Linux servers and maintaining them in production environments. We have solutions for all the different types of servers commonly used in small and medium sized businesses. We know what works and have the ability to duplicate our successes and make them work in your computing environment.